Tuesday, 19th June 2012. Local stock index and other regional index welcomed the outcome of Greece election as new political government vouch to gradually settle their financial troubles. Other news to follow. "- U.S. stocks on Monday ended with losses for the Dow industrials but a third straight rise for the S&P 500, as Spanish bond yields hit a euro-era high, countering cheer that came with the results of Greek elections. After falling 71 points and rising more than 14 points, the Dow Jones Industrial AverageDJIA -0.20% ended down 25.35 points, or 0.2%, to 12,741.82. Chevron Corp. CVX -0.83%contributed the most to the blue-chip index’s point loss as energy stocks followed oil lower on concerns about Spain’s rising borrowing costs and global oil demand. The S&P 500 Index SPX +0.14% rose 1.94 points, or 0.1%, to 1,344.78. Gains among the 10 index sectors were led by consumer discretionary, particularly home builders and restaurant stocks, and technology. Energy fell 0.8%, one of two sectors to end lower. The Nasdaq Composite COMP +0.78% rose 22.53 points, or 0.8%, to 2,895.33, also its third straight rise." "-Most Asian stocks rallied Monday on hopes Greece will remain in the euro-zone after weekend election results showing a narrow win for a pro-bailout party, although analysts cautioned the advance may be short-lived. Australia’s S&P/ASX 200 index AU:XJO +1.96% jumped 2%, while Japan’s Nikkei Stock Average JP:100000018 +1.77% , South Korea’s Kospi KR:SEU +1.81% and Taiwan’s TaiexXX:Y9999 +1.76% each gained 1.8%. China’s Shanghai Composite CN:000001 +0.40% rose 0.4%, while Hong Kong’s Hang Seng Index HK:HSI +1.01% closed up 1%, with both ending off the day’s peak." "-August Soybeans finished up 16 3/4 at 1373 3/4, 4 3/4 off the high and 16 up from the low. November Soybeans closed up 25 1/2 at 1339 1/2. This was 21 3/4 up from the low and 1 1/2 off the high. August Soymeal closed up 5.9 at 409.5. This was 6.2 up from the low and 2.4 off the high. August Soybean Oil finished up 0.22 at 48.84, 1.16 off the high and 0.14 up from the low. November soybeans traded 25 higher towards the end of today's trading session. The prospect of warmer and drier weather over the next 7-10 days offered support to the new crop contract. The drier than normal forecast could raise doubts as to how much double crop beans are planted. Traders see crop conditions slipping 2% for the crop rated good to excellent for this afternoons update. Weekly export inspections came in at just 7.897 million bushels which was well below trade expectations. Traders noted liquidation in the SN/SX spread as their focus shifted towards potential yield loss for new crop beans." 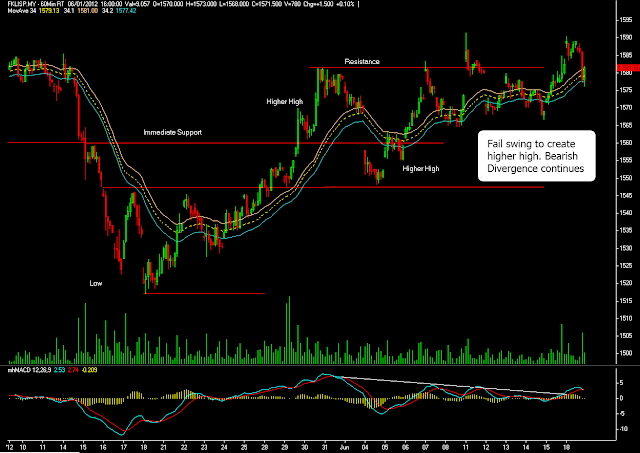 FKLI- Gained Made But Caution Ahead. The FBM KLCI continue to inches up yesterday amid positive news over the political development on Greece. The new elected government on Greece is expected to make some financial reforms to reduce their risk of debt default. Asia market was traded in the positive zone in early session but retraced later on the afternoon session as U.S Dow futures index starting to give up its gain, prompting temporary rallies due to Greece election news. For index futures, the June contract was not able to sustain its gain after it gap up in the morning session and closed one point lower to 1,581.50, the day high and low were 1,590.50 ~ 1,576. Technically, market is hovering on recovery mode so far even though we are looking on strong Bearish divergence occur on hourly chart shown above. For today, market is expected to retrace further if there is any negative performance on the U.S stock index, while upside is limited around first pivot resistance level today. FCPO-Bulls Win The Battle, For Now. CPO futures recovered as Soya oil prices surged on Greece election outcome but rallies might be short live one as traders foresee the real issue on their debt default risk is still presence. The new benchmark Sept manage to closed at the high of the day, closing RM50 higher to 2,899 level. 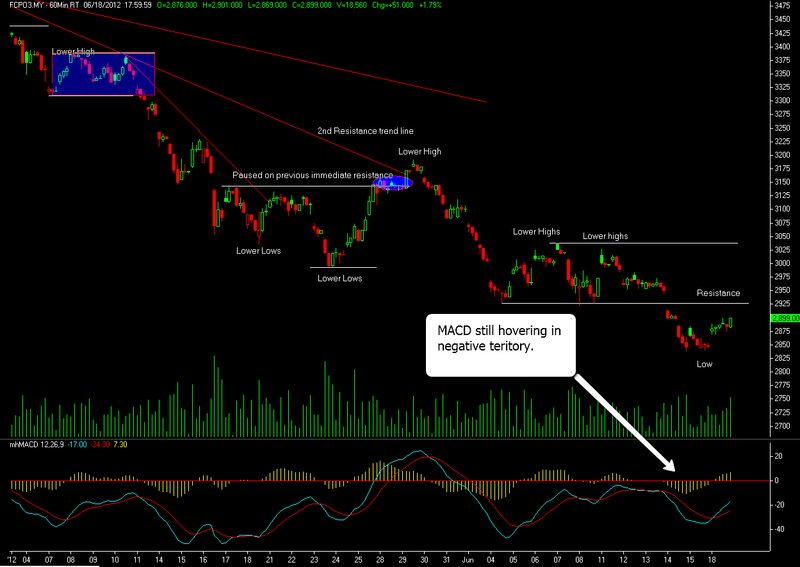 This recovery does not change the overall landscape on palm oil prices as market is still travelling in Bearish mode. Sellers will be gauge or take action when the market hit the next resistance trend line around 2,928 shown on hourly chart above. Based on previous Bearish price action accompanied with series of lower highs and lower lows, the recovery made on yesterday was not a strong indication for the market to recover further. Most professionals also hint that the rallies caused by Greece polls are likely short live as they (the Greece officials) are yet draft out how to finance their debt without borrowing from external sources. For today, support is located around 2,857 while resistance is pegged at 2,921.